My review of Limbo is up over at PopMatters. I was excited to finally play it, as the game caused quite a stir last year. Even now, it still provokes strong feelings. The people that loved it and those that hated it provided one another with enough rhetorical kindling to keep the debate alive for the better part of a year. I was ready to fall into one of the extreme camps, but I ultimately had a fairly neutral experience. I didn't like it as much as Brad Shoemaker. I didn't hate it as much as Mitch Krpata. I wasn't as moved by its themes as Kirk Hamilton. There were flashes of brilliance alongside some questionable design choices. Ultimately, I decided that the game looks like it has a lot to say, but never commits to making any meaningful artistic statements. My thoughts on Limbo's sound design didn't make it into the review, but it definitely deserves praise. Limbo is a very quiet game, but its sound effects are more than just aural set dressing. In several instances, sections of the puzzles are off-screen and sound effects serve as crucial clues. It made me realize how often I take sound for granted when playing a game. Sometimes it can be tempting to tune out background noise or to start multitasking by listening to music or a podcast while playing a game. 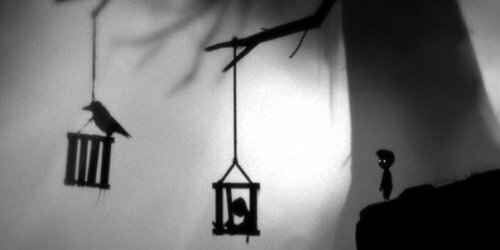 Limbo requires the attention of your eyes, hands, and ears, which makes it a great example of how a game's sound works with the mechanics and visuals to create a rich experience. I'm interested to see what Limbo's developer, Playdead, will create next. Clearly, they have a talent for creating intriguing game environments and evoking strong feelings. Hopefully, the underlying mechanical and thematic messages in their next game can match these strengths. I can never multitask or put on different music when playing a game, unless it's multiplayer COD or something which is really noisy anyway (Forza). Or sometimes in a big huge open-world game (Fallout) I'll put on something in the background but very quiet, so I don't miss anything. But it has to fit, like Suburbs of Goa. I'm usually the same way, but every once in a while I find myself picking up bad habits. I remember when consoles first started getting hard drives there was a rash of games where you could input your own soundtrack, but I get the sense that has fallen out of favor.